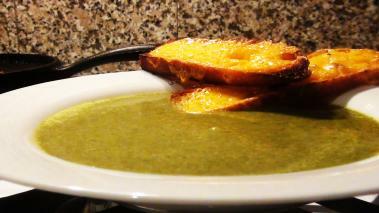 Broccoli soup is not only a great tasting dish, but also one of my favorite ways to get move vegetable into my diet. While I more than happy to have a couple broccoli florrets on the plate, I find them a bit boring. But cooked in this soup, along with a few other ingredients, the broccoli takes on more complexity and flavor. To add a bit of texture and of course another flavor, I’ll show you how to make some cheddar croutons, which add a great contrast. Together, it’s a perfect way to start a meal, and will definitely win points, for the health diet crowd. Similarly, I add a bit of cream at the end of cooking to add a bit of richness to the soup – you can also leave that out. Broccoli is not the easiest food to pair with wine, but if I was going to I’d go with a Sauvignon Blanc. The good amount of acid with cut through the rich soup. However, what I’d really drink is a good dark beer!